To date, Elite EMS have transported hundreds of patients to and from treatment centres across the across the midlands. Non Emergency Patient Transport (PTS) is at the heart of service provision at Elite EMS. Following the introduction of a new management structure and specialist support, Elite EMS now assists NHS organisations, private healthcare providers and other public sector organisations. After financial input and ‘growing up’ in a highly contested market, we have achieved excellent results in quality care and customer services. 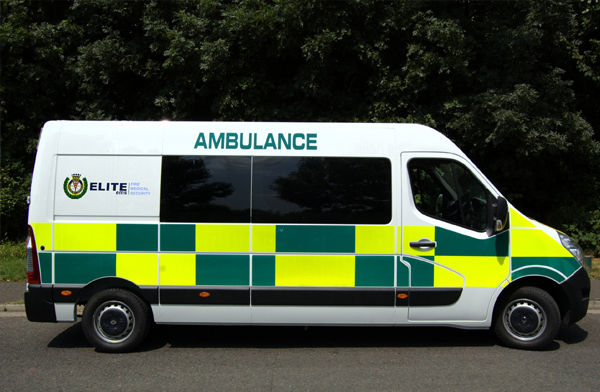 Accredited by the East of England Ambulance Service and West Midlands Ambulance Service, Elite EMS provides a professional dynamic service that offers value for money. Elite EMS PTS staff undergo stringent training in line with the NHS Core Skills Training Framework in order to provide an essential service for people with a medical need. Staff are also trained with specialist knowledge of comprehensive first aid, Medical Gases, Defibrillator, Paediatric Immediate Life Support, driving skills and patient moving and handling techniques. All Elite EMS PTS staff are dedicated to reach the highest standards of care, and to exceed the government target of 95% of patients arriving within 30 minutes of their appointments. In fact, over the last year, 97% of patients arrived before or on time for their appointments. Elite EMS PTS vehicles are designed and adapted for the comfort and safety of the patients. Using cutting edge design technology that complies with current legislation, we are able to safely secure patients in wheelchairs of any type. The Patient Transport Service conveys a wide range of patients to and from their homes to out-patients’ appointments, clinics, physiotherapy or non-urgent inter-hospital transfers.